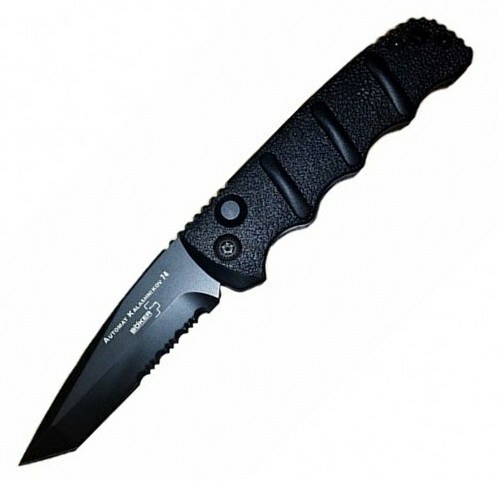 Boker Kalashnikov 74 Auto Knife Black Black Tanto Serrated This is a best seller and gets high marks for quality in an economy knife. Very solid and very quick it's a great everyday carry auto for the entry level user. This knife has a drop point or tanto blade of AUS8 stainless with a satin finish. Blade length is 3 5/16", handle measures 4 1/4" with an overall open length of 7 9/16". Very fast action. Molded ABS body is lightweight and corrosion proof. Has a slide safety and comes in a cool padded box shaped like an AK47 magazine. A handy pocket clip has been added for convenient comfortable carry and quick access. This knife is rated a BEST BUY! !